Quick note, as always, anything in RED is a link to more information. So let’s look at these numbers from a slightly different perspective. For January 2018, $29.8 million was paid under the new Redesign code set with $14.9 disbursed under the contingency plan payment. Total reimbursed for the first 7 weeks of new BH redesign codes is $56.7 million. That amount is about half of what January 2017 alone had in reimbursements for Behavioral Health services. HALF of January for 7 weeks. 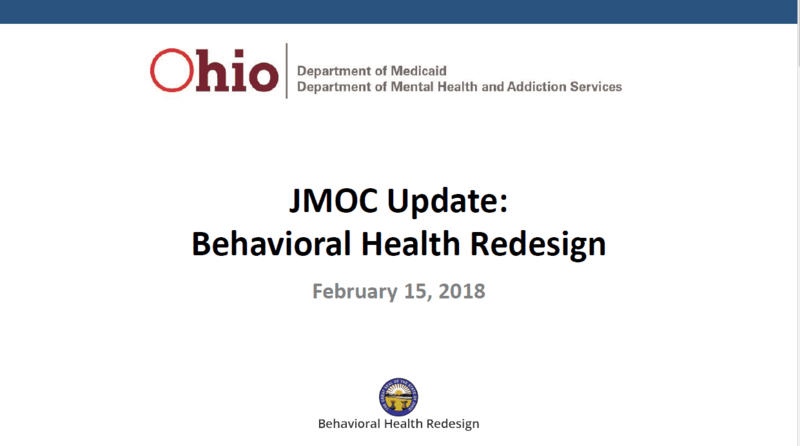 So essentially, as stated by The Ohio Council for Behavioral Health and Family Service Providers, post Redesign billing is significantly lagging. 433 unique providers (out of 636) have submitted claims for services under redesign, and of those, 94% have been paid for claims. In reviewing the claims tracker presented by ODM as part of their presentation, you can clearly see that the overall denial percentage is 25%. Keep in mind, this would represent only denied claims, not accepted claims with a denial attached that will reduce reimbursement. So where exactly is this 94%? The belief is that of the 433 providers that have submitted claims, 94% have been paid for at least one claim. In addition, of the $56 million paid, 23% of that has been paid for agency’s utilizing the MITS portal because their software either isn’t ready, they don’t have one, or it doesn’t have the functionality to manage the complex coding that is the BH Redesign. 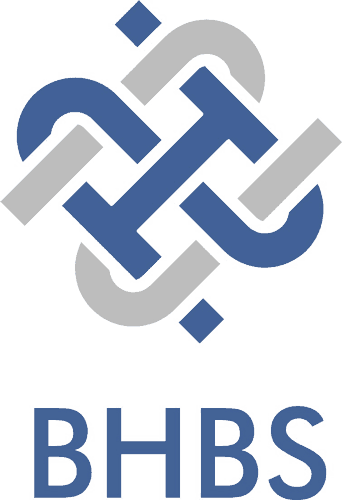 A third important piece to note and stew on is the total number of agency’s providing Behavioral Health services in the state of Ohio has varied significantly throughout this process. It started at 600+, then during the pre-go-live JMOC meetings it dropped to just over 400. Now, surprisingly, it’s back to 636 (or 666 if you look at the claims tracker header). Not exactly sure what that means but it’s very interesting. Could it have been to provide better numbers during Beta testing? It’s certainly possible, however, the numbers were awful regardless of the total number of agency’s impacted and it still went forward. Personally, I believe at any given time, the state of Ohio knows how many agency’s in the state provide BH services and are certified as an 95 or 84 provider type. And finally, let’s look at the fact that 433 agency’s have submitted, at a minimum, 1 claim that paid. This means that as of February 15th, 2018, 203 agency’s have not submitted anything, manual or EDI. 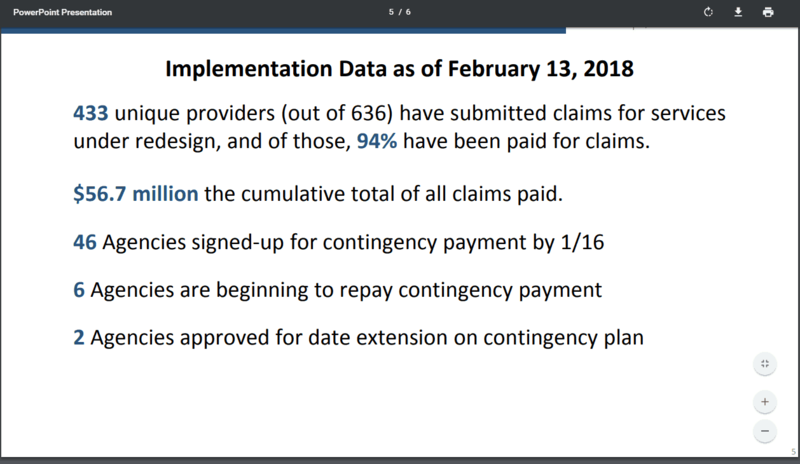 That essentially means 1/3 of the providers in Ohio currently are not submitting claims post Redesign and are therefore either not getting paid anything or are participating in the Contingency plan payments, which will end in approximately 2 months. So as we get closer to the end of February, BHBS will continue to do our best to help clients, old and new, get their system’s ready to bill. If you are an agency currently unable to bill with your software or billing manually and receiving less than 50% of expected revenue as payment, consider submitting a request for the contingency plan payment. It isn’t sufficient however, it may make the difference between whether or not you make payroll while you determine your next steps moving forward. Also, reach out to every member of the JMOC committee. They are here to represent YOU. They can’t do that if they don’t know what your struggles are.